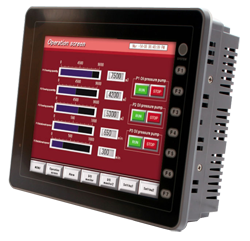 Continuing a 20 year history of providing cutting edge Human Machine Interfaces (HMIs), the "V8" and "Technoshot" touch screen panels offer more cost saving features than ever before. 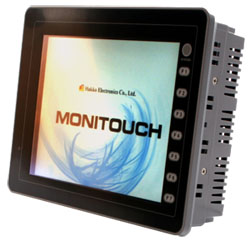 A large range of screens from 5.7" to 15"
Whether you need to improve the useability of your machine or collect manufacturing data for your statistical analysis, Hakko Monitouch has a touch screen to suit the size of your budget. Smaller screen sizes offer a cost sensitive way of displaying and interfacing with your machine, whille larger screens offer a large range of data collection and interface capabilities. Monitouch is configured using a PC software application called V-SFT5, which provides drivers, ready built libraries of graphics for graphics to display data, graphs, trends, lamps, buttons and switches. In fact you can create any graphical image and turn it into a switch that will interact directly with your PLC or any other device on your network. The Hakko Monitouch extensive range of HMI solutions starts with the low cost reliable V6 series and ends with the high performance, high visibility V8 series. Note: The Hakko Monitouch range of product is also known as Fuji Electric UG series. For more information please contact us. The Fuji Electric POD and the Hakko Monitouch share the same hardware. The differences lie in the firmware as both devices are manufactured by Hakko. We are confident that Hakko Monitouch are the best HMIs. If you are looking to move from Proface HMI to Monitouch, we have presented the equivalent models in the table below in order to help you. 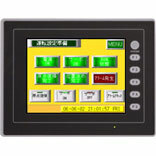 Most of the functionality available in Proface HMI's are available on Hakko Monitouch HMI's. If you have any queries, please do not hesitate to contact us. Is it possible to upload the settings to a PC? Yes. 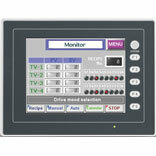 The firmware and configuration of all screens in the Monitouch range can be uploaded to a PC using a number of methods. 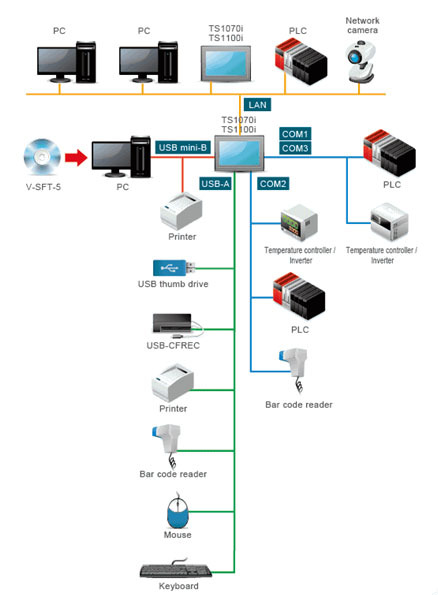 The easiest way is using the V-CP cable and the V-SFT software which are desinged specifically for this purpose. There are six different sizes of screen. 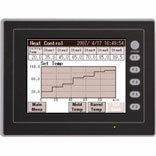 Note that larger screens offer a large range of data collection and interface capabilities. Can I use a Hakko Screen with a Siemens S7 PLC? Yes, there is a long list of drivers available for the Hakko Screen, which enables it to communicate with a large range of devices. To view the list for Version 8 screens click here . There a similar lists for V6 and V7 screend enabling screens to communicate with over 200+ PLC's, 100+ variable speed drives, 50+ temperature controllers. How do I configure a Monitouch Touch Screen? Monitouch is configured using a PC software application called V-SFT5, which provides drivers, ready built libraries of graphics for graphics to display data, graphs, trends, lamps, buttons and switches. In fact you can create any graphical image and turn it into a swicth that will interact directly with your PLC or any other device on your network. How Much does V-SFT cost? We currently have a promotion on sales of V-SFT and all upgrades are free! I have a Fuji Electric UG220, is this similar to Monitouch? Where can I get more information, pricing and delivery for this item?